Partido Manggagawa (PM): Youth group asks: Are there decent jobs for OFW’s going home plus new graduates? Youth group asks: Are there decent jobs for OFW’s going home plus new graduates? In reaction to President Rodrigo Duterte’s call for some 260,000 OFW’s in Kuwait to come home, the youth group Partido Manggagawa-Kabataan (PMK) asked if there are decent jobs awaiting them in the Philippines. “We welcome our parents coming home from Kuwait so families can be reunited. But are there regular jobs paying living wages for them and the 600,000 new graduates plus thousands more finishing K-12 that won’t go to college? The reason OFW’s go to Kuwait and elsewhere is because of lack of decent jobs in the Philippines,” asserted Kim Dolojo, PMK spokesperson and a PUP student. 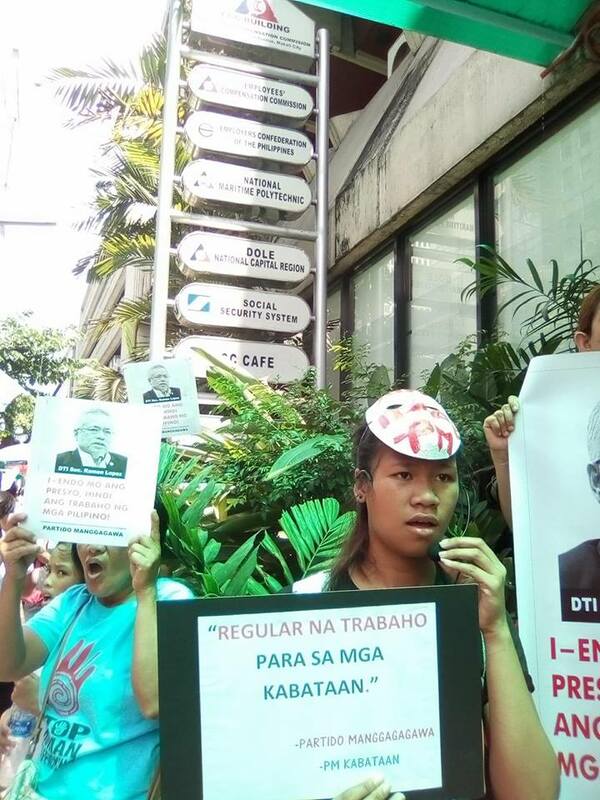 Last week, PMK held a protest at the offices of the Department of Trade and Industry (DTI) and the Employers Confederation of the Philippines (ECOP) to highlight its call for decent jobs for young workers. “President Duterte is again making a personal promise, this time of providing jobs for OFW’s. But he has yet to deliver on his campaign promise two years go to end endo the moment he assumes the presidency. Mr. President, not another broken promise,” Dolojo warned. PMK is raising a red flag as the World Bank recently released a report about the lack of quality jobs in the country and the worsening inequality as a result. The group is likewise questioning ECOP for the Jobstreet data that only 24% of employers are willing to hire K-12 graduates. “An employers organization, the Philippine Chamber of Commerce and Industry earlier questioned that the minimum number of hours required of senior high school students are not enough to train and qualify them for entry-level work,” Dolojo explained. She cited the International Labour Organization (ILO) report titled “Global Employment Trends for Youth 2017: Paths to a better working future,” that stated that youth unemployment rate for Southeast Asia and the Pacific is seen to rise from 11.7 percent in 2016 to 12 percent in 2017, and to 12.2 percent in 2018.